Last week the San Antonio Hispanic Chamber of Commerce teamed up with representatives from Fortune 500 companies, governmental agencies, universities and colleges, and local high schools to host the third annual CORE4STEM EXPO at the Henry B. Gonzalez Convention Center. The EXPO is part of the Chamber’s STEM initiative to encourage students by increasing awareness and interest in college and career goals with a long term effect of attracting higher paying jobs to San Antonio thus strengthening and increasing the cities prosperity (“Core 4 stem,” 2012). Approximately 2,000 7th and 8th graders had the opportunity to broaden their understanding of STEM college and career goals by participating in hands-on activities, viewing demonstrations, and hearing from guest speakers including Jose Hernandez, the first Latino astronaut. Thanks to the coordinating efforts of Helen Torres, SAC Director of Partnerships and Extended Services, and her staff, San Antonio College had the opportunity to participate in the EXPO by hosting hundreds of students with learner-centered hands-on sessions in STEM fields. 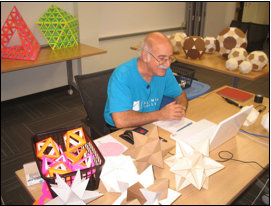 Students were introduced to the world of “Polyhedron and OCTA-TETRA Models” by Dan Suttin, SAC Math Lab tutor, where they learned the connections between these shapes and their applications to careers in architecture, engineering, design, art and mathematics.They were able to apply cyber security principles through simulated programs led by Troy Touchette, chair of Computer Information Systems, where they defended computers from hackers. They also visited five activity tables led by SAC STEM students where they were introduced to multiple engineering careers including Bio Engineering using equipment provided by the SAC Biology Department and Geothermal Engineering using models provided by Adelante Tejas. Following these activities the students participated in Q&A sessions with Dr. Dan Dimitriu, Program Coordinator of SAC Engineering, and current SAC engineering students Kat Bently and Christopher Woods. At the completion of each session the SAC College Connections team distributed buttons, backpacks, T-shirts, and information regarding the STEM programs available to their age group on our campus. This event was a great success for our city and due to the collaborative efforts of all the STEM affiliated departments on our campus; it was a wonderful representation of the opportunities available to students through San Antonio College. Analisa Garza is the MESA Center Coordinator. takes care of sick people in a hospital? Do you think of a person who works in a doctor’s office or a clinic who give pills and shots? Most students who apply to the Nursing program at San Antonio College have an idea of what it means to be a nurse. When looking at nursing on a broader level of a profession, however, our image is not as clear. Within nursing, we have licensed vocational nurses (LVN) and registered nurses (RN). Both levels are licensed to practice by the state upon completion of their programs, but the amount of training is different. Licensed vocational nurses receive one year of training and a certificate upon completion. Registered nurses may receive their training at a two-year community college and receive an associate degree or at a four-year university where they receive a bachelor’s degree. Registered nurses may further their education at a master’s or doctorate level. Licensing ensures that all nurses are safe to practice in their jobs, and institutions that hire nurses ensure that the nurse’s job responsibilities do not exceed the level of training the nurse received. However, some research is finding that nurses at the bachelor’s level or higher can better deal with the evolving and complex healthcare system of the future. In 2008, The Robert Wood Johnson Foundation and the Institute of Medicine undertook an initiative for the purpose of making recommendations for the future of nursing. A report, released in 2010 was titled “The Future of Nursing: Leading Change, Advancing Health.” Regarding nursing education, the report recommended that “nurses should achieve higher levels of education and training through an improved education system that promotes seamless academic progression.” The report further recommended that by 2020, the proportion of nurses with a bachelor’s degree should increase from 50 percent to 80 percent. The ability to progress to the next level of education is not new in nursing. Mobility programs have been in existence for many years for LVNs to further their education and become registered nurses. Programs are also available for registered nurses with associate degrees to obtain bachelor’s degrees. Many of RN- to-BSN programs are available but currently only about 17 percent of nurses with associate degrees continue to a bachelor’s degree. From this report, an idea was born in Texas to reduce barriers in the state that hinder successful academic progression from an associate to a bachelor’s degree in nursing. This initiative became the Consortium for the Advancement of Baccalaureate Nursing Education in Texas (CABNET). San Antonio College is among 45 community colleges and 16 universities that have expressed interest in participating. In addition to reducing transfer and financial barriers to educational progression, CABNET has taken on a broader goal of revising the way nursing education is taught. Content taught in the various nursing programs would build from basic knowledge and skill taught at community college level to deeper learning at the university level. This common curriculum would eliminate duplication of courses and re-teaching of content that currently exists. The CABNET plan allows for all required general education courses to be taken at the community colleges that would further reduce tuition costs. Finally, the CABNET plan still allows for the student, upon completion of the associate degree requirements, to become licensed and enter the workforce as a registered nurse. The CABNET initiative is moving into its development phase with the plan to begin implementation in Fall 2013. 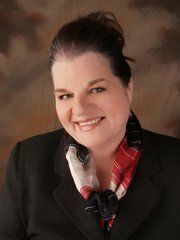 Dr. Roswitha Davies is an associate professor in the Nursing Department @ SAC. Getting prepared for a career in Information Technology can be a challenge. It is essential to have both experience and training for this industry. Training can be expensive and building experience can be difficult. The training provided in San Antonio College’s Computer Information Systems Department is probably one of the most economical sources in the area. It is top-notch training at a reasonable cost. For those willing to start early, the deal is even better. The Alamo Academies Information Technology and Security Academy (ITSA) allows area students to take dual-credit courses during their last two years of high school and earn more than 30 hours of college credit at no cost to the student. The training in this program is provided by San Antonio College and includes the same college level courses taught on the main campus and includes the course ware certified by the National Security Agency to meet the Committee on National Security Systems Standards. During the summer of their first year ITSA students work in an internship program that gives them valuable experience in the industry. Many of the students continued to work for the organizations after the summer internship ended. After finishing at ITSA, students can complete an Associate’s Degree in Information Security and Assurance and ultimately can transfer into a Bachelor’s degree at a four-year university. It’s a very good way to get an early start for those interested in a career in Cyber Security. Did you know that nearly half of all incoming freshman in the United States go to a community college? Did you know that about 60 percent of those incoming freshman are not prepared for college level work? Many students just don’t know how important this test is. The results from this test are going to determine if you are ready from college level courses or if you are going to need remedial classes. So how can we help you get ready to re-test on the Accuplacer? Enter Super P.A.S.S., Preparation for Accuplacer Student Success. Super P.A.S.S. is a two-week accelerated remediation program created to improve student success for the large number of students who arrive unprepared for college level work. It is composed of seven hours of Reading instruction and 15 hours of math. OK, now who will need to take Super P.A.S.S? Starting in the spring semester of 2013 it will be mandatory for incoming freshman who score in the bottom two levels of math and reading to register for Super PASS. The idea is to help students review, relearn or maybe learn things for the first time. In addition this experience is designed to provide an important boost in confidence as students begin their collegiate journey. But the big picture is, let’s try this again, let’s take this Accuplacer test and be ready for it. We have morning, afternoon and evening sessions. The first session will begin Oct. 29, the cost is $75 and you can register for these classes at the Continuing Education Registration Desk. For more information, visit the website at http://www.alamo.edu/sac/super-pass. Sophie Caldera-Castaneda is the coordinator for Super PASS/Math PASS at San Antonio College.